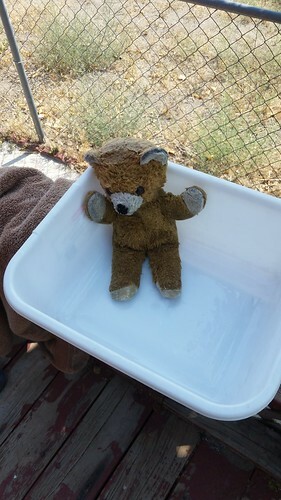 Today was the Day of Reckoning for Kuma Bear: his annual bath. 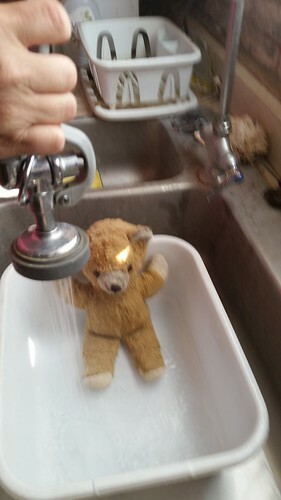 Lisa used the kitchen sprayer and mild soap to gently clean Kuma Bear. She complained that he has dirty socks. I suggested that maybe Kuma gets up at night and prowls around the kitchen looking for spare fish. Outside on the porch it was hot and dry, which is good weather if you're a poor pathetic little stuffed bear complaining that you'll never be dry ever again. "Fishes gos in thes waters, nots Bears!" 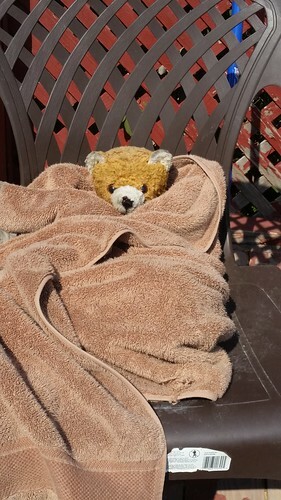 Lisa dried Kuma Bear off and squeezed water from his paws, then wrapped him in a towel and let him sit in the sun for a while, but not for a long time because she doesn't want his fur to fade any more than it has. After spending much of today sitting outside drying off, Kuma was mostly dry by dinnertime. Lisa says he's still grumpy.